I’m always on the hunt for quick protein fixes, especially when I get home from the gym and want to fill my belly right away. In It Starts With Food by Melissa and Dallas Hartwig, they advise to eat protein 15 minutes after a workout. I try really hard to make sure that happens and sometimes it’s difficult because I’m really not into shakes or fancy drinks. These egg muffins are perfect! You can pack them to take to the gym with you and eat cold, or pop them in the microwave for 30 seconds when you get home. There are all kinds of variations you could do with these: ground beef and salsa, bacon and veggies, ham and raw cheese, etc. 2) Melt the coconut oil in a large pan over medium heat. 3) Remove the casing from the chorizo sausage and crumble into the pan. Fry until cooked through. 5) Crack the eggs into a large bowl and whisk them until well blended. 6) Add in your sausage and veggies and mix well. 7) Pour into a lined or well greased muffin tin and bake for 20-30 minutes, or until a toothpick inserted into the middle of a muffin comes out clean and dry. This recipe yielded 15 muffins. That has to be one of the best episodes of Friends, am I right? My family celebrated Canadian Thanksgiving a week early this year, much to the delight of my turkey loving self. One of the great things about celebrating with my family is that we are all focusing on living healthy, balanced lifestyles, which makes family dinners fun, easy and no one is needing maternity pants. I want to eliminate your excuses for hopping off the healthy bandwagon around holidays, so here’s the run down of what we ate and a few other recipes that I would like to try next year or some that I think sound delicious. I can’t do the grocery shopping or cooking for you, but these clickable links should save you some time. As I have explained in previous posts, when it comes to holidays or special occasions, I don’t eat strictly Whole30 or Paleo. Read here about how I found that balance. Basically, pass the pumpkin pie and whipped cream please! We also had some very definite non-paleo perogies, because we’re Ukrainian, and because they’re delicious. There are some things you just don’t mess with. Amen. We enjoyed a fresh baked pumpkin pie from a local farm, but when I searched online, tons of recipes for healthy pumpkin pie came up. Next year I would like to try something like this one. Happy Thanksgiving to all of you. I hope you enjoy some time giving thanks with loved ones! I’ve got this really great friend. In the past year or so, I’ve watched her completely dive in to a healthy lifestyle for her and her family. She’s a busy super mom who runs an in-home daycare and yet she’s managed to build a healthy lifestyle through working out (often including her kids and husband) and healthy eating. We’re big food nerds and so we often send each other picture messages of what we’re eating. (Don’t judge me. I seriously LOVE FOOD.) 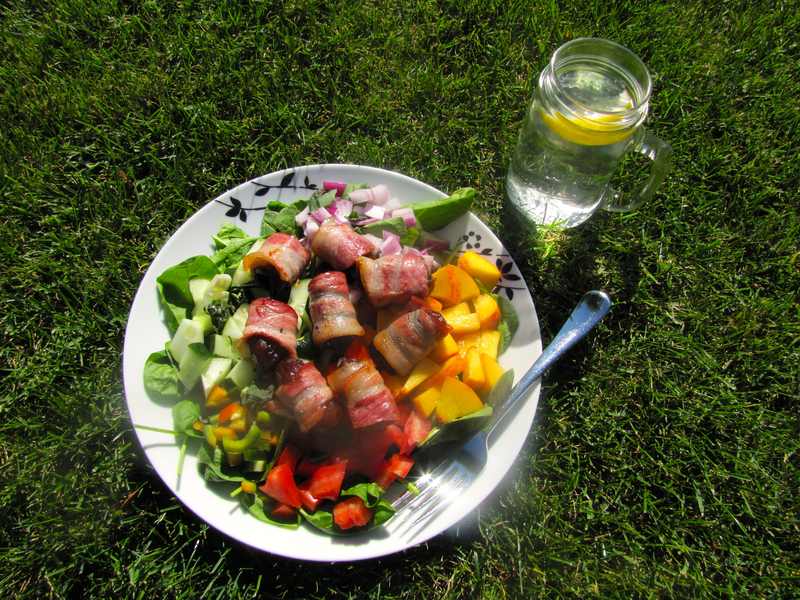 The other day she sent me a picture of her lunch: a salad with bacon wrapped dates on top. I drooled a little, and then got to work making my own version. I came up with this, and now I kinda wanna eat this every day for the rest of my life. 1) Preheat your oven to 400 degrees fahrenheit. 2) Using a small, sharp knife, carefully slit a hole in each date and remove the pit. 3) Cut your bacon slices in half so you have 8 pieces, each a couple of inches long. 4) Tightly wind a piece of bacon around each date and secure it by piercing all the way through with a toothpick. 5) Place the bacon wrapped dates on a baking sheet lined with parchment paper and bake in preheated oven for 20-30 minutes or until bacon is cooked to your liking. 6) Once cooked, remove from the oven and gently pat dry each bacon wrapped date. Set them aside to cool. 7) Place your spinach on a large plate or in a large bowl and throw all your vegetable toppings and nectarine on top. Add your bacon wrapped dates and enjoy! Eat outside as often as you can. Food just tastes better outside. Week 3! Finally in the second half of Whole30 where everything starts feeling gooooooood. I can’t believe that I can wake up now and actually function without coffee. I definitely still miss the taste, but I’m so glad that I’m not relying on it. What do you find the most challenging about Whole30? For me it’s definitely the social functions. I hate being the odd one out, not eating yummy treats at a ladies night or dinner get together. I also hate turning down food that has been cooked for me by someone who loves me. A friend of mine had me over last night and baked a wonderful looking gluten free peanut butter pie and I felt awful for turning it down. I REALLY hate being thought of as the girl who is always on a “diet”. That’s not at all who I am, but when you give the 30 second Whole30 run down to someone, it can certainly come across that way. However, with all that being said, I’ve found that most of those people at those social functions eventually come to me later wanting more information about Whole30. I’ve seen a lot of them change their lifestyle around completely, and then it’s all worth it, right? We’re spreading the Good Food Word. Plus, no hangover, no food baby, and no extra toilet time. Here’s what I’m eating this week.